Inside Track Magazine features BuildTrack Smart Automation! 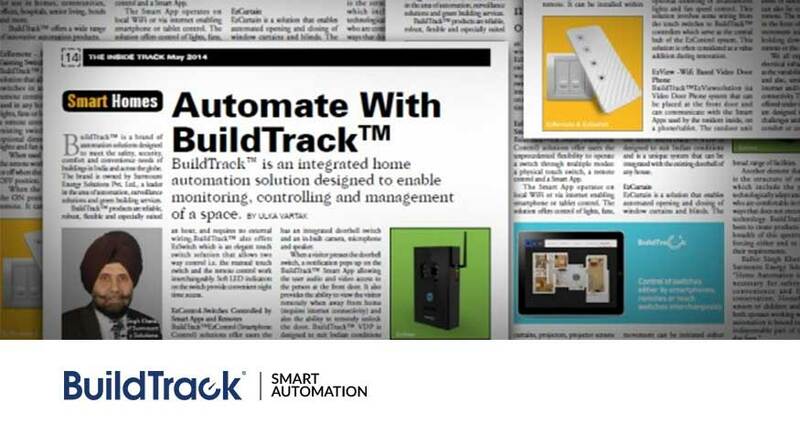 Inside Track magazine has featured an article on BuildTrack smart automation products in its May 2014 issue. The article titled “Automate with BuildTrack” emphasizes on how BuildTrack automation solutions are designed to meet the safety, security, comfort and convenience needs of buildings in India and across the globe. This follows closely in the footsteps of another leading magazine Home Review, which also talked about the BuildTrack Smart Automation products in its March 2014 issue. Inside Track is one of India’s leading magazines focusing on the needs of the entire interior design community consisting of the end customers, architects, product manufacturers and distributors. Balbir Khera Surmount Energy CEO had this to say “Home Automation is no longer to be interpreted as a luxury; it is increasingly becoming a necessity for safety, security, convenience and for energy conservation. Households with seniors or children and those with both spouses working will find that automation is bound to become an indispensable part of their day to day lives. Industry publications like Inside Track and Home Review as well as their peers are playing a valuable role in bringing this area to the forefront. We are delighted that they are choosing to showcase BuildTrack as a leading manufacturer of automation products and solutions in India. The article in Inside Track featured products like EzRemote which allows remote control of lights/fans or any other electrical devices without replacing existing switches. Also, mentioned were the products like BuildTrack EzControl and EzView. EzControl allows you to control the entire home through a smartphone or tablet and EzView which is a wifi enable video door phone that can be accessed via smart apps.